Louis the Stammerer (French: Louis le Bègue) (1 November 846 – 10 April 879) was the King of Aquitaine and later the King of West Francia. He was the eldest son of emperor Charles the Bald and Ermentrude of Orléans. Louis the Stammerer was physically weak and outlived his father by only two years. 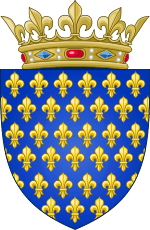 During the peace negotiations between his father and Erispoe, duke of Brittany, Louis was betrothed to an unnamed daughter of Erispoe in 856. It is not known if this was the same daughter who later married Gurivant. The contract was broken in 857 after Erispoe's murder. 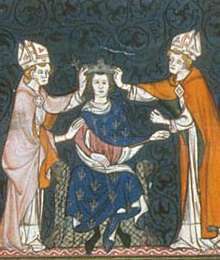 His second wife Adelaide of Paris had one daughter, Ermentrude (875–914) and a posthumous son, Charles the Simple, who would become, long after his elder brothers' deaths, king of West Francia. 1 2 3 Rosamond McKitterick, The Frankish Kingdoms under the Carolingians, (Pearson Education Limited, 1999), 258. ↑ John VIII, Pierre Riche, The Papacy: Gaius-Proxies, Vol. 2, ed. Philippe Levillain, (Routledge, 2002), 837. Wikimedia Commons has media related to Louis II of France.